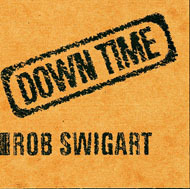 Eastgate Systems announces the publication of Rob Swigart's long-awaited collection of hypermedia stories, Down Time. Down Time consists of twenty-one stories of the computer age, connected by shared characters, events and objects. A police officer, a terminal patient, a computer technician, and a high-school guidance counselor are just a few of the characters we follow as they try (and fail) to understand themselves, their lovers, and the strangers they meet. Interactive elements allow readers to create their own paths through different stories, revealing new correspondences and connections. Rob Swigart, an affiliate of the Institute for the Future, develops scenarios for Fortune 500 companies. He is the author of eight novels including Little America, The Time Trip, and The Book of Revelations. An interactive novel, Portal, was published by Activision in 1986 on computer disk, and appeared in print two years later from St. Martins Press. He is also the author of Directions (hypertext, available from Eastgate Systems). Most recently he co-authored, with Robert Johansen, Upsizing the Individual in the Downsized Corporation. He is presently finishing a novel about Central American archaeology.